If you enjoy being outdoors in the fall, here is a tour for you! Also part of this tour is a a 2-hour train ride through upstate New York as well as a 1-hour wild animal safari at Hidden Valley Animal Adventure park. And oh yes, an evening visit to the Seneca Allegheny Casino and a bit of shopping time at two shopping malls. Have we whetted your appetite yet? Hope to see you on the tour! Two nights hotel accomodations in Bradford, PA.
2 breakfasts & 1 buffet lunch. Admission to Hidden Valley Animal Adventure and 1-hour animal safari. Day trip on Longhouse Scenic Byway through Allgheny Mountains. Visit to Kinzua Sky Walk. Optional evening visit to Seneca Allegheny Casino Resort, no additional cost. 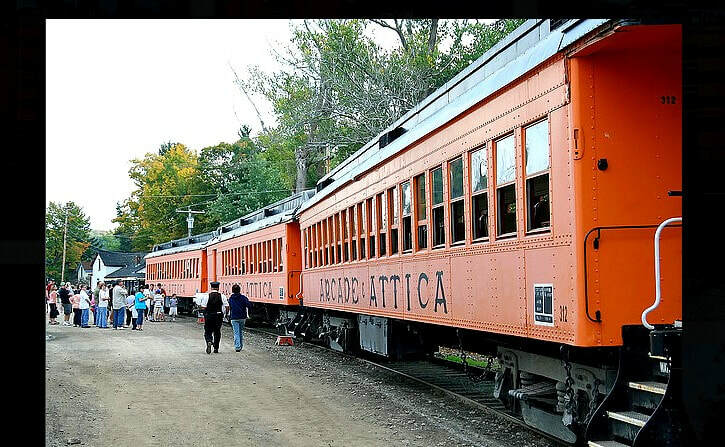 One ticket on Arcade & Attica Railroad with 2-hour train ride through upstate New York. Shopping & lunch stops at Fashion Outlets of Niagara Falls and Walden Galleria malls. All prices are per person, in Canadian dollars. All taxes & tips are included! Optional evening visit to Seneca Allegheny Casino Resort is restricted to adults 21+. All payments are final payments and non-refundable. Once the world's highest and longest railroad bridge, measuring 301 feet high and 2,053 feet long. The bridge stood for 121 years. The bridge partially collapsed under the powerful winds of a tornado in 2003. In 2009, work started to reinvent the remaining towers of the historic viaduct as a pedestrian walkway. Today it has been reinvented as the Kinzua Sky Walk — a spectacular walkway that once again allows the public to “Walk the Tracks Across the Sky.” A partial glass-bottomed observation deck enables visitors to look down at the remaining towers supporting the historic structure. The Longhouse Scenic Byway is a 36-mile loop that runs through the Allegheny National Forest. Visitors will often feel as if they are driving through a tunnel as they drive through the northern hardwoods and hemlock trees of the Allegheny, surrounded by oak and black cherry. 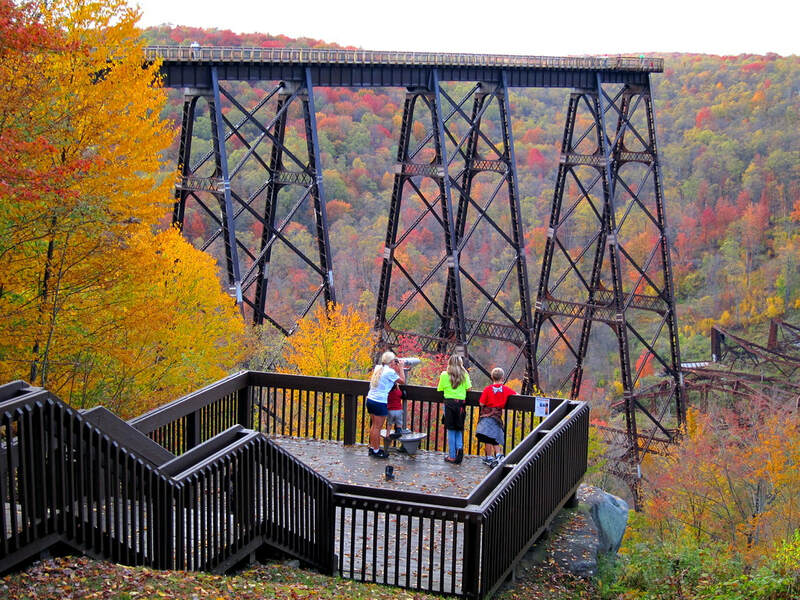 Along the way we will be stopping at the Rimrock Overlook and Kinzua Point for some wonderful photo opportunities. We will stop in Kane, PA for our lunch, a lovely buffet in a manor that sits on top of the Allegheny Plateau. Step back in time aboard one of the last operating short-line train excursions in New York State from a bygone era. "Welcome Aboard The Train To Yesterday . . ."
Your journey aboard the Arcade & Attica Railroad begins even before you board the train. As you enter the historic station, you are surrounded by the history of railroading in America. Tour the historic station and view all the exhibits, from antique railroad lanterns to switch locks, even to an old switch stand. Nostalgic original photographs depict an era of days gone by. With an "All Aboard", the whistle blows, and the whoosh of the air brakes releasing can be heard. Very soon, the engineer has gotten the train up to speed and you are on your way, enjoying your 90-plus minute ride through history. The Wild Game Safari Park Tour is a 55-minute guided safari tour through the park on park trolleys that features over 400 animals and more than 30 species. 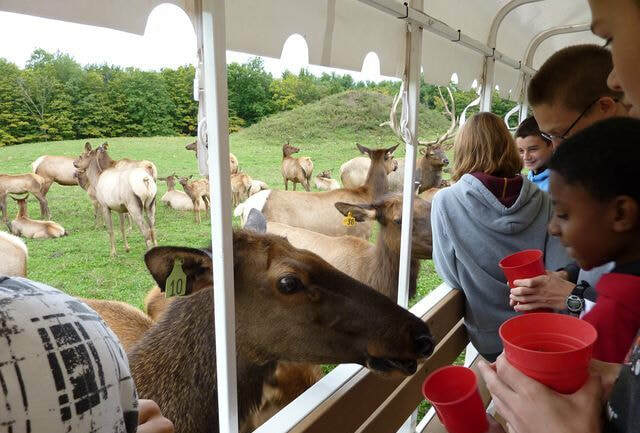 Each guest receives a cup of grain when boarding and the tour makes various stops to feed the tamer animals. The visit also includes admission to the Small Animal Adventure where visitors get an even closer look and chance to interact with the smaller animals. 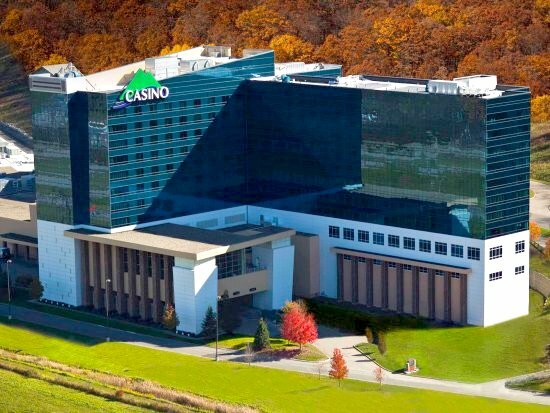 On day 2 of our trip, after our day of touring the scenic byway and the Kinzua sky walk, we will return to the hotel to freshen up and then, we will have an optional evening visit to the Seneca Alleghny casino. There is no extra cost for this side trip if you wish to join us. The casino is approximately 30 minutes from our hotel. The casino has been rated a CAA 4-Diamond property for the last 7 consecutive years, has 1800 slot machines, lots of casino table games, 5 restaurants & 2 bars.